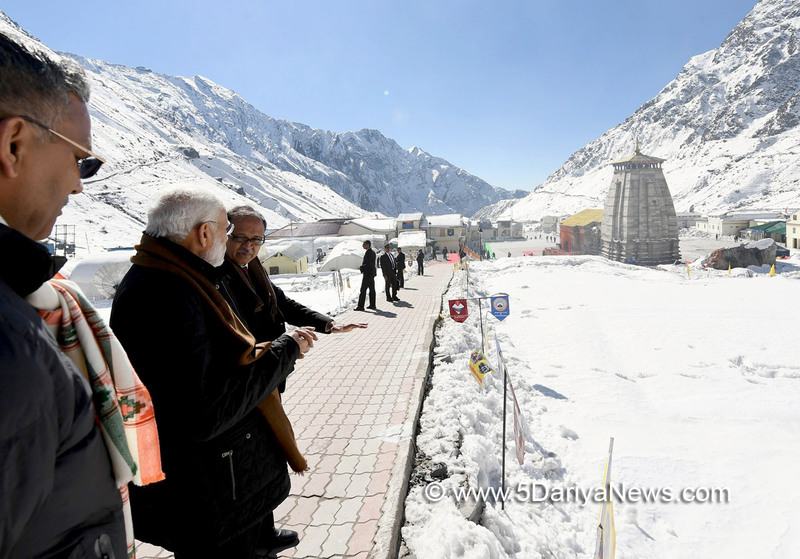 Prime Minister Narendra Modi arrived here on Wednesday and left for Kedarnath in a chopper, officials said.The Prime Minister flew into the state capital in a special Indian Air Force (IAF) plane. He was received at the Jolly Grant airport by Chief Minister Trivendra Rawat and other senior officials.Besides praying at Kedearnath's Lord Shiva shrine, Modi will also review the reconstruction work of the famous temple which was devastated in the 2013 flash floods that killed thousands.The Prime Minister has taken personal interest in the reconstruction and has visited the shrine twice in the last six months.It has been snowing in the region for the past few days and the road from the VIP helipad to the shrine that had been covered with snow has been cleared. Modi is also scheduled to watch a video presentation prepared by the state government officials on the reconstruction work of the guest house near the shrine. According to reports reaching here, the Prime Minister might visit Harshil where he will spend Diwali with Indo-Tibetan Border Police (ITBP) troopers. On Tuesday, Army chief Bipin Rawat visited Harshil and reviewed the preparedness of the troopers.